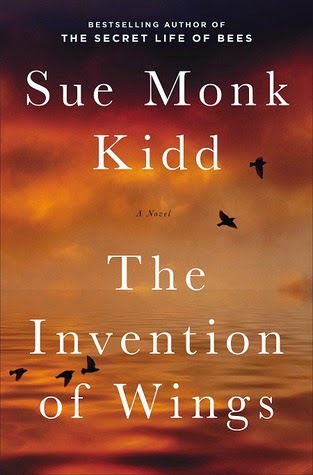 My thoughts: I had the opportunity to hear Sue Monk Kidd speak the night this book came out. At that point, I had not read her other book, The Secret Life of Bees, so I was unfamiliar with her work. But, as I sat in the auditorium of the Greenwich Library listening to her speak about herself, her reasons for writing this new book, and all the research she put into it, I knew this book was going to be an amazing read and I was definitely not mistaken. I decided to listen to the audio of this book, after having such a good experience with the audio of The Secret Life of Bees which I picked up shortly after that night with Sue Monk Kidd - and what a great decision. Part of that decision came from the fact that SMK read a few sections of the book that night and while she does not narrate the book herself (she just narrates the author's note at the end) I felt that having the book read to me would really enhance the overall enjoyment of it. I loved this story, plain and simple. It's a powerful, thought-provoking read about the atrocities of slavery in the South. Focusing on two courageous sisters, who in my opinion should be in the history books, we follow them as they fight to not only abolish slavery but also to gain equality for women's rights. Blending fact with fiction, SMK gives us this remarkable, at times tough, story of a girl who was given a slave at the age of eleven. Sarah wanted to free that slave but was unable to and basically spent her life trying to find a way to get Handful that freedom, even going so far as to teach Handful to read. I found myself very inspired by Sarah. She was certainly a spirited girl who knew what she wanted and wasn't afraid to fight for it. She wanted her freedoms and wasn't going to stand for the social norms of her times. I think that is what caused a lot of the friction between her and her mother - a character I could not stand! At the end of the book, in the author's note, you find out where SMK got the inspiration for this book. She also goes on to explain where she stayed true to history and where she used fiction to round out the story. This part of the book is just as interesting as the story itself, in my opinion. I love when authors share their inspiration and decisions for why they do what they do. This is the type of book that stays with you long after you finish reading it. While I did listen to the audio version, I do have a signed copy of the print edition, which I'm glad, because it's definitely a book that I want on my bookshelf. Audio Thoughts: The narration of this book was beautifully done. It was easy to tell who was narrating each section and both narrators brought the characters to life. Having the author narrate the author's note at the end was a special treat as well. *** Devourer of Books hosts Sound Bytes - a monthly link-up to share the audio books that everyone is listening to. 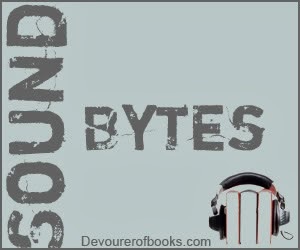 Stop by and you just might find your next audio book! 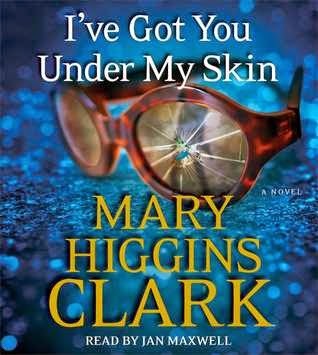 My thoughts: It's been a while since I've read a Mary Higgins Clark book and it's the first time I've decided to listen to one and I have to say I was pleased on both accounts! Reading, or in this case, listening, to this book has reinforced my love of this author and I can't wait to go back and pick up some of the books I've missed! What I loved about this book is that as the book progressed, and the two mysteries were coming to a close, the short chapters added to the overall tension of the book, ramping up the suspense and having me sitting on the edge of my seat! Mind you, I was in the car driving down to Georgia for my brother's wedding as I was listening to this, a 12.5 hour drive, so this was the perfect audio for a good chunk of that time! I have to say I was quite surprised with who the one murderer was - I definitely did not see that coming at all! The stories itself were quite interesting with characters that were both really likeable as well as a few that got on my nerves. The four grads now women all had their own reasons for killing Betsey Powell and as their stories as told, it's easy to want to think they each did it. But, as the true story-teller she is, MHC gives us enough red herrings that it's hard to guess the identity of the actual murderer until the very end. The other story is flushed out almost from the beginning - we know who the murderer is, we just don't know why he's targeting Laurie's family and what his next steps will be. This alone adds even more tension and suspense. As I said in the beginning of this review, it's been a while since I've picked up a MHC book, but it won't be long before I pick up another one. If you're a fan of hers, what would you suggest I start read next? Audio Thoughts: This is the first time I've listened to Jan Maxwell narrate a book and I enjoyed listening to her tell this story. I don't know if she does all of MHC's books, but I surely wouldn't mind if she did. She was able to give each of the characters their own unique voices, infusing just the right amount of tension into her voice when needed. 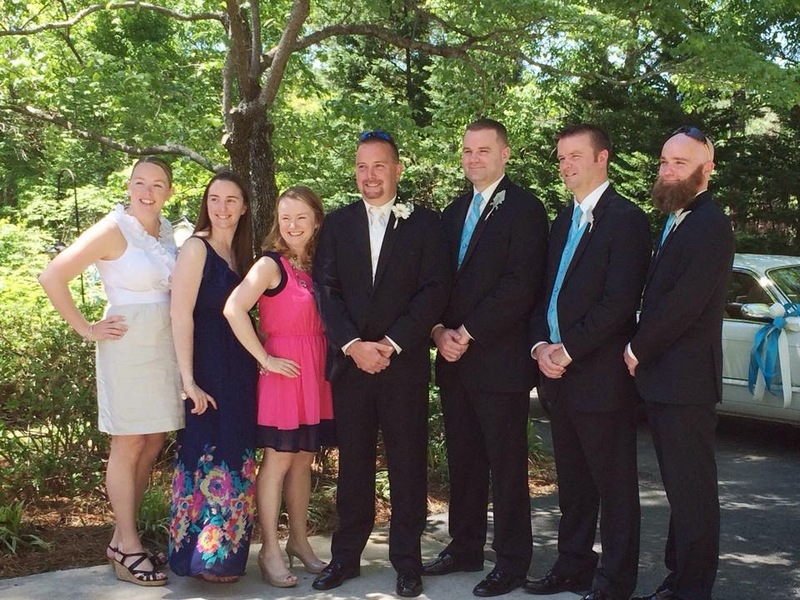 This past weekend, my brother got married - he was the last of us to tie the knot!. I drove down to Georgia from New York on Thursday and then headed back home on Sunday, so while it was a short trip, it was great seeing all my family. Having six siblings that live all over the east coast and one in London, it's hard to get us all together often, but when we do, it's great fun! Here's a picture of me and my siblings - while I am the oldest, I also happen to be the shortest - even with my heels! (I'm in the pink dress.) There is 9.5 years between me and the youngest, who is my sister standing right next to me. The groom is the second youngest. My thoughts: I really like this series. I find myself flying through the pages, engulfed in the story and most times I am unable to figure out who-dun-it! This time, there was quite the twist thrown in - a twist that I had guessed might be going on - that added a nice layer to a really good mystery. But unfortunately, I didn't figure out who the actually killer was...oh well. 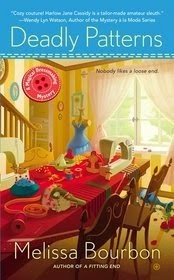 I just love the idea of dressmaking and how Melissa Bourbon is able to tie in the different themes to all her books. In this latest installment, the book is centered around homecoming and so Harlow Jane is helping the local high school girls with their dresses and their mums - a tradition of the town. I actually found this to be quite fascinating, how each girl would decorate their mum with bits and pieces of themselves. How I would love to have actually seen a real picture of one! I love that Harlow Jane's leading man, Will, has really come to believe in her gifts - not only her "magical" gifts, but also her newly acquired gifts of solving these murders that she happens upon. While he was reluctant at first to have her involved in helping with these cases, now that this case involves her daughter's boyfriend, he not only wants her to help, he uses "we" when talking about whatever needs to be done! How sweet is that! I have loved watching their romance blossom in this series and this is why I really like to read series in order - to see the character development happen chronologically. The cases and murders don't rely on each other from book to book, but the character development surely does! I really can't wait for the next installment of this series - this is quickly becoming one of my favorite cozy mystery series!!! A Killing Notion by Melissa Bourbon is on tour with Pump up Your Book Book Tours. Be sure to check out the other tour stops to read more reviews, guest posts and interviews. This week didn't go quite as planned. I woke up Monday morning feeling as if I was coming down with a cold and with my brother's wedding this weekend, I decided I take it easy this week - just do some easy walks with the dogs and get lots of rest. My thoughts: While I liked the added dimension of the two designers and the models to this installment, what really stole the show for me was the storyline of the upcoming wedding of Harlow Jane's mother and the sheriff. From the description of the dress to the fact that Harlow Jane would soon to step-siblings to her least favorite deputy, I was in stitches! As far as the murder goes, I was able to guess the killer, but the red herrings did have me questioning myself a few times. A good installment, but not quite my favorite. My thoughts: I really enjoyed this book - it was a light tale that just seemed to pull me in right from the beginning. Maybe because it was a tale about sisters or maybe because the setting is so close to where I live, but I felt that I could relate to this book. 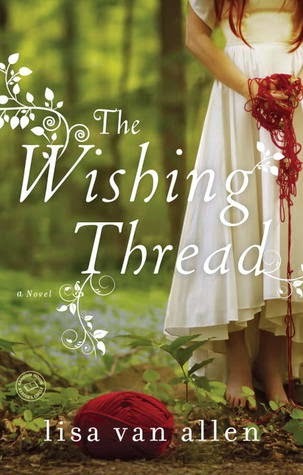 I also found that the magic that was woven throughout the storyline was so cleverly used that it never once felt contrived - much like Sarah Addison Allen's books are and you know I'm a huge fan of her books! I loved that while a big part of this book focused on Aubrey, we did get to "know" all Van Ripper sisters and find out what really pulled them apart. Coming together after the death of their aunt, they learn a lot about each other and just how far they are willing to go in the name of love. While I am not a knitter, instead I crochet, I could appreciate the tidbits about knitting and the magic that comes from having that handmade item. Of course, items that comes from The Stitchery go one step further by actually knitting people's wishes into the items, but when we hand-make a blanket or scarf for someone in whatever medium we use, don't we make it with our own version of that - our best hopes and wishes for the recipient? Couldn't that at some level be considered the same thing? I found this magical tale to be a great story. It was so easy to get totally wrapped up in the story and not want to put it down. I can't wait to see what Lisa Van Allen writes next! Audio Thoughts: This is the first book I've listened to that Amy Rubinate has narrated and I really enjoyed listening to her. 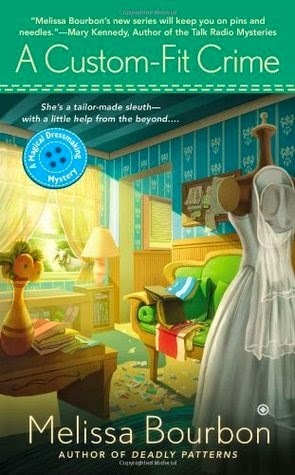 She was able to create unique characters and give this book just the right touch of whimsy I think it needed. I am looking forward to listening to more of her work. After years of struggling to raise her child and pay the bills, Daphne now has a successful restaurant, a growing reputation as a chef, and a wealthy fianc?-everything she's ever wanted. But across the ocean, Yia-yia can see through the storybook perfection of Daphne's new life- and now she is calling her back to Erikousa. She has secrets about the past to share with her granddaughter- stories from the war, of loyalty and bravery in the face of death. She also has one last lesson to teach her: that security is not love, and that her life can be filled with meaning again. My thoughts: This is a beautiful story about a young woman and the bond she shares with her grandmother. Having a strong bond with my own grandmother, I was pulled into the story and had a hard time putting the book down once I started it. Daphne has not had an easy life. She has faced many tragedies in her young life and so she becomes almost solely focused on making a good life for her and her daughter, forgetting about the world around her. She doesn't take the time to enjoy life, to enjoy spending time with her daughter doing fun things, sharing things with her. It's not until they head to Erikousa and Daphne's Yia-yia's for her upcoming wedding, that she starts to realize just how much she has let pass her by. I loved Yia-yia and her stories. I admit that I am not all that familiar with the Greek myths, but did enjoy reading about the stories that Yia-yia would tell. It kind of makes me want to read up on some of the the Greek mythology! I loved the way Yvette Manessis Corporan was able to take the myths and draw them into the her storytelling - it never once felt forced but rather seemed perfectly blended. There is much love and heartbreak in this novel. Secrets are revealed, history is shared and food is made - delicious, mouth-watering meals that seem to be the staple of any family. And the descriptions of the setting made it feel as if I were right there in Greece alongside Daphne myself - a place I hope to get to one of the days!!! I look forward to seeing what else Yvette Manessis Corporon writes, as this one was definitely an enjoyable read. 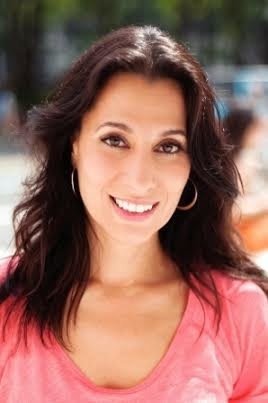 About the author: Yvette Manessis Corporon is an Emmy Award-winning writer, producer, and author. She is currently a senior producer with the syndicated entertainment news show Extra. In addition to her Emmy Award, Yvette has received a Silurian Award for Excellence in Journalism, and the New York City Comptroller and City Council’s Award for Greek Heritage and Culture. She is married to award-winning photojournalist David Corporon. They have two children and live in New York. 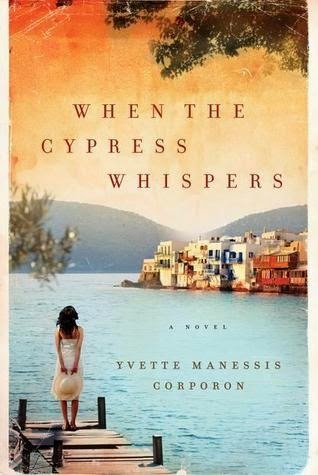 To see who else is participating in Yvette Manessis Corporon's When the Cypress Whispers tour, click here. Thanks to Trish at TLC Book Tours I have one copy of When the Cypress Whispers to give away to my readers. This giveaway is open to US/Can residents only and ends April 28th. For those that celebrate, Happy Easter!!! My hubby and I are having a quiet weekend. He's busy getting his new boat, a mini transat, ready to put in the water - the long winter has delayed everything. That's actually fine with me, as I could really use the quiet weekend. 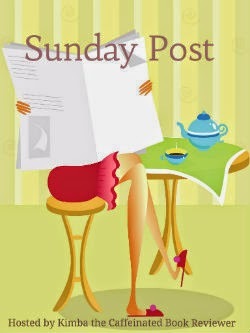 Between being away last week at my dad's and then heading out of town again next weekend for my brother's wedding, I'm using this quiet weekend to catch up on everything from cleaning my house to blog stuff!!! Bliss, Texas, is gearing up for its annual Winter Wonderland festival, but when a mysterious Scrooge ends the merriment with murder, it'll take more than a ghost from Christmas past to set things right. Designing a holiday fashion show set in the town's most prominent historic mansion seems like a job tailor made for dressmaker Harlow Jane Cassidy. But with the mansion's restoration still in progress and threatening weather on the horizon, she's feeling on pins and needles more than reveling in holiday cheer. 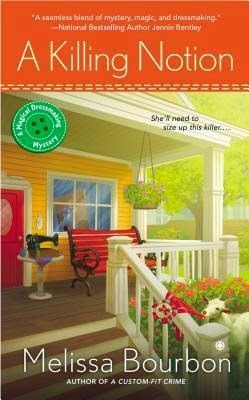 My thoughts: I really enjoy this cozy mystery series. The magic is light, the characters are quirky and fun, and the mystery is engaging with just enough red herrings to keep you guessing right up until the end. Harlow Jane's romance with Will is heating up and she has to decide whether or not to bring him into the fold - can he be trusted with her "gift" and the secrets of her family? And speaking of secrets, yet more secrets are revealed in this installment, including some new additions to Harlow Jane's family tree. I'm back home after a week up at my dad's and the weather was all over the place...it was warm, rainy and we even had a little snow! We've had frost warnings the last two mornings...I thought it was Spring but I think Mother Nature is a bit confused! Anyway, the dogs and I have been enjoying taking lots of walks each day - it's really helping to get those steps in! I have a fitbit and wear it all day long. I do my "fitness" walk in the morning, which is what I track below, but I have another goal - to get 10,000 steps in 5 days a week and on my off days, to try to get at least 5,000 steps. (And this week it looks like I'm target to hit that goal!) Do you have a fitbit? If so, and you're looking for friends, let me know! I love the motivation of that leader board!!! In the spirit of The Guernsey Literary and Potato Peel Pie Society and The Unlikely Pilgrimage of Harold Fry, Gabrielle Zevin's enchanting novel is a love letter to the world of books-and booksellers-that changes our lives by giving us the stories that open our hearts and enlighten our minds. My thoughts: Every once in a while, you read a book that you just love so much, it's hard to put into words. That's this book. I am so glad that the powers-that-be over at She Reads picked this for our April Book Club Selection - I had never heard of Gabrielle Zevin before, but she is definitely on my radar now. This book is about a bookseller and his love of books. I loved A.J. - he's a quirky, unique character that just wormed his way into my heart. From the first pages of the book, I was hooked and couldn't put this book down. 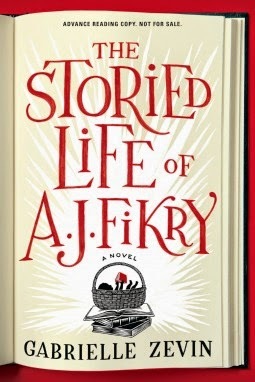 There was something so endearing about A.J., he's the type of character that stays with you long after you finish the book. I also loved the other characters, too, especially Amelia, Maya and Lambiase. Such an interesting cast of characters make up this book! There are relationships forged in A.J. 's bookshop that change lives. It's a sweet, charming story that will at times have you laughing and at times have you shedding a few tears. It's about love, second chances and of course, a love of reading. I've always had a pipe dream of opening my own bookstore and if I ever do, I hope that I have one like Island Books - one that encourages people to read, where people who previously shied away from books start running to the bookstore when new books are released, where the shop becomes a cool place to hang out, where authors love to come visit. This book gives me the hope that maybe one day my dream can become a reality! This book is definitely a keeper - I certainly foresee myself rereading it many times. It's also a book that will be at the top of my book recommendation list when friends or family ask what to read next! 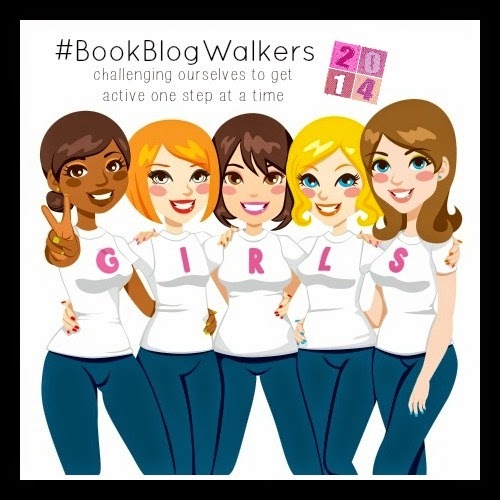 Head over to the She Reads website to read other reviews and related posts as well as a chance to win a copy of the book.